Road trip films have their own charm and some of the most memorable films in the West belong to this genre. Even Bollywood has excelled in this genre with films like PIKU , QARIB QARIB SINGLLE , ZINDAGI NA MILEGI DOBARA , HIGHWAY , JAB WE MET , YEH JAWAANI HAI DEEWANI  etc. Irrfan Khan, surprisingly, has appeared in two such films in recent times – PIKU and QARIB QARIB SINGLLE. 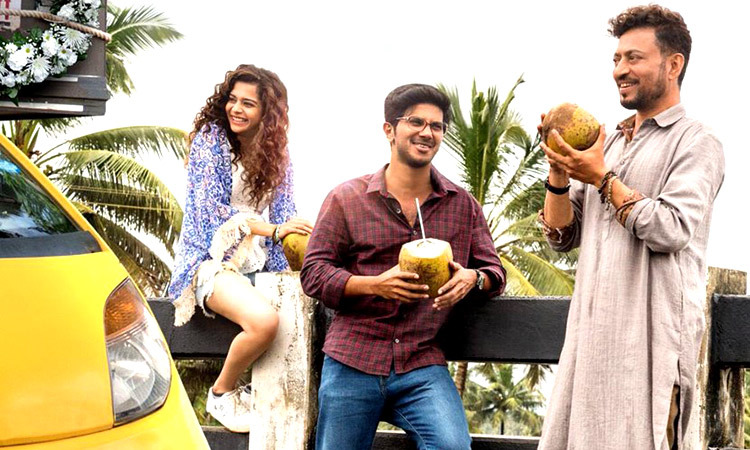 And now he’s all set to complete his travel trilogy with KARWAAN, which is the Bollywood debut of South star Dulquer Salmaan and the first leading role for internet sensation and Marathi actor Mithila Palkar. So does KARWAAN manage to entertain and motivate like other films in this genre? Or does it disappoint? Let’s analyse. Bejoy Nambiar’s story is promising and could have made for a great script. But Akarsh Khurana and Adhir Bhat’s screenplay fails to take advantage of this wonderful opportunity. The film moves at a snail’s pace and many developments don’t happen organically. Also, the entire track of Avinash’s father forcing him to give up photography is something that’s been done to death in our films, most notable and recent example being TAMASHA . Hussain Dalal’s dialogues are funny and witty, yet worded simply. The ones mouthed by Irrfan Khan stand out. Akarsh Khurana’s direction is weak and he also lets go of the opportunity of turning a somewhat flawed script into a good film with his execution. One doesn’t feel much for the characters due to the way the narrative pans out. Except for the part where Shaukat speaks about his father, no other scene moves viewers, not even the monologue of Tahira and Avinash. Also, the predictability sets in since one knows that the road trip films usually end with the characters getting transformed ultimately. Hence, despite the scene of Avinash in the end with his boss being a good one, it doesn’t make the desired impact as the audiences already see it coming. KARWAAN begins well and the frustration of being a part of a profession that doesn’t suit Avinash is well depicted in the initial scenes. One expects things to get better once the road trip begins. And it does get better but not to a great extent. The film drags and a lot of humour and situations seem forced. The character of Tanya is half-baked and the writers should have etched this part in a better way. The intermission point is funny and again, the hopes rise for a better second half. Alas, that doesn’t happen and the film remains flat in the last hour as well. Even the climax lacks punch. In fact, the Indian audiences might have strong reservations in the manner in which Tahira and Tanya organize a feast, play cricket and make merry as if nothing untoward has happened in their lives, just hours after the funeral. On the positive side, the film has some funny moments that succeed in raising laughs. The best part in this regard is that track of the shehnai wallah (Habib Azmi). It’s sure to bring the house down! Irrfan Khan delivers a decent performance and contributes to the laughter quotient, but only at places. Almost all his dialogues are worded to create an effect and the endeavor fails. Compare this with Irrfan’s previous travel films – QARIB QARIB SINGLLE and PIKU – where the humour flowed organically. Unfortunately, that doesn’t happen here. But he surely dominates the film and gives the most memorable performance out of all actors. Dulquer Salmaan makes a confident debut. He understands his part well and watch out how he carefully ensures he doesn’t go overboard. This aspect would surely be loved. Mithila Palkar is strictly average. Her character lacked depth and even performance wise, she could have brought out various shades which would have enhanced the impact. Alas, her performance looks a bit monotonous. Amala Akkineni is genuine. Akash Khurana is good as the autocratic father. Kriti Kharbanda (Rumana) is quite lovely in the special appearance, but again, her track fails to add much to the film. Donna Munshi (Tasneem) has a striking face and does very well. Habib Azmi gives a fine performance. Beena is alright. The actors playing the cargo office staffer, Avinash’s boss, Rumana’s husband, new employee at Avinash’s office and Nambiar are good. Music goes well with the narrative but isn’t something that would have a long shelf life. ‘Chota Sa Fasana’ is the best of the lot and is like a theme of the film. ‘Heartquake’ comes next and works due to its quirky lyrics and situation. ‘Saansein’ is also fair and the rest are forgettable. Anurag Saikia’s background score is good but could have been a bit more subtle. Avinash Arun’s cinematography is breathtaking and captures the locales so well that one feels that one is actually a part of the ‘Karwaan’. The lensman had earlier shown his magic in MASAAN  and DRISHYAM  and directed the acclaimed Marathi film KILLA  and he ensures that he keeps his credibility intact. Tiya Tejpal’s production design is passable. Three locations – the house of Rumana, Tahira and Nambiars – all seemed to be shot at one location. Ajay Sharma’s editing is too slow and could have been slick. Also, the manner in which the flashback of Prakash Rajpurohit would suddenly pop up seemed unconvincing. Jaya Taurani’s costumes are fine. On the whole, KARWAAN is a good opportunity gone waste. 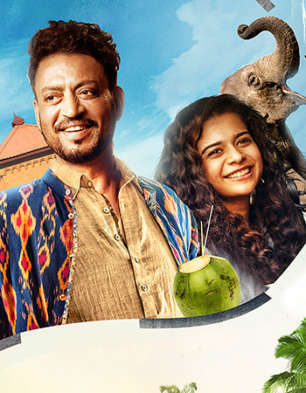 Irrfan Khan is the biggest draw of this film but the audiences might be dejected to not see him in his full glory. At the box office, the film is going to struggle to stay afloat.